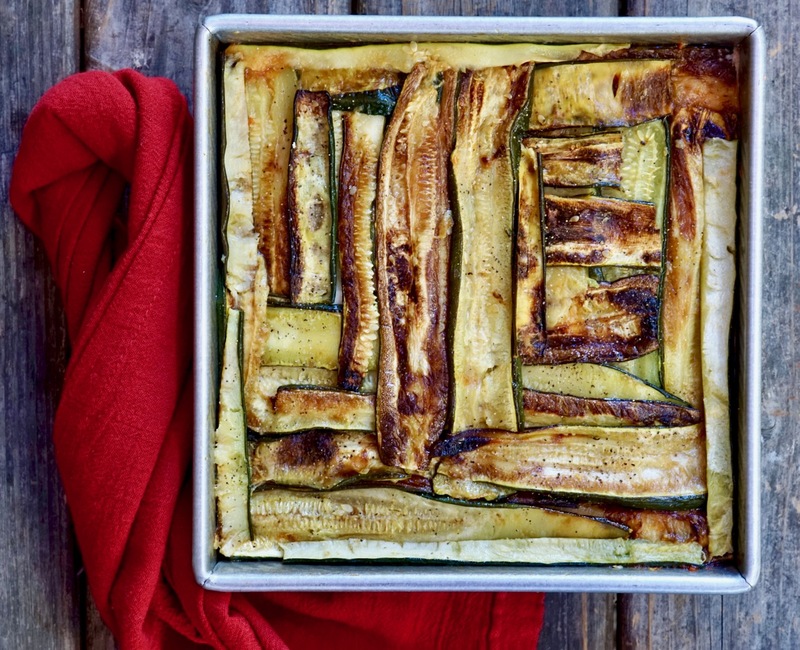 For the Zucchini: Preheat the oven to 450 degrees F. Lightly grease three baking sheets and set aside. 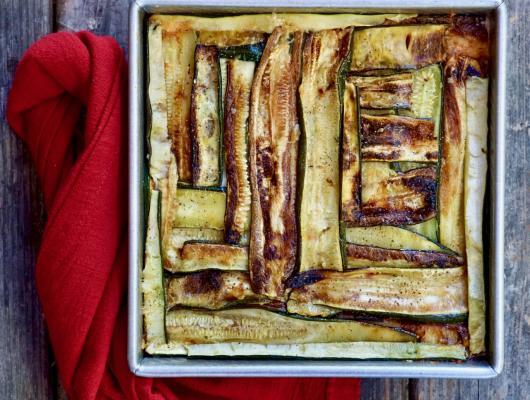 Place sliced zucchini on the prepared baking sheets in one layer being careful not to overlap. Using a pastry brush, lightly brush one side of the sliced zucchini with the olive oil. Season with salt and pepper. Place in the oven and bake for about 20 minutes or until cooked and you begin to see some coloration. Remove from the oven and cool. To Assemble the Lasagna: Using an 8×8 baking pan, spoon 1/3 of the tomato sauce on the bottom of the pan and spread out evenly. Arrange 1/3 of the roasted zucchini slightly overlapping in an even layer on top of the sauce. Sprinkle 1/3 of the mozzarella over the zucchini. Spoon 1/3 of the ricotta evenly over the mozzarella. Spoon more sauce over the ricotta and using the back of a large tablespoon, lightly spread out the sauce and ricotta cheese as well as possible. Repeat the above process once more time. Cover the top of the lasagna with the remaining 1/3 of the zucchini and top with the remaining mozzarella cheese. Place the lasagna on a baking sheet and place in the oven. Bake for about 40-45 minutes until bubbling and you begin to see some nice coloration on top. Turn on the broiler and broil for about 1-2 minutes to make the cheese on top nice and melted, and a little crispy. Remove the lasagna from the oven and allow to rest for about 10 minutes before slicing.